It’s a tricky balancing act … between the desire to be in control and the need to be adaptable. With so many of us wanting the world to suit them, and them alone, regardless of the impact on others, I am reminded of how the jigsaw puzzle encourages the idea of everything in its rightful place. This idea of the rightful place grew from my latest puzzle. I noted that the dark corner on the left was slightly different to the dark corner on the right. On the left, the grain of the canvas showed through the paint. On the right, the paint surface was smooth. Sorting the dark pieces into places of “belonging” did not sit comfortably with me. I thought of reservations, asylums, institutional care, segregation, compounds and gated communities. In response, I set aside this idea of rightful place and pursued instead a creative alternative. So, for my Mini Jigsaw today, I’ve tried to mix them up – the right and the left. It’s not an easy task in a puzzle where each piece is unique. Cardboard has limited capacity to be flexible. Our society at the moment seems to be about as flexible as cardboard. It seems that everyone expects the other to show flexibility. Change. Agree with me. Be me. Yet it is from an exploration of alternatives that new ideas and insights can emerge to solve the unsolvable. 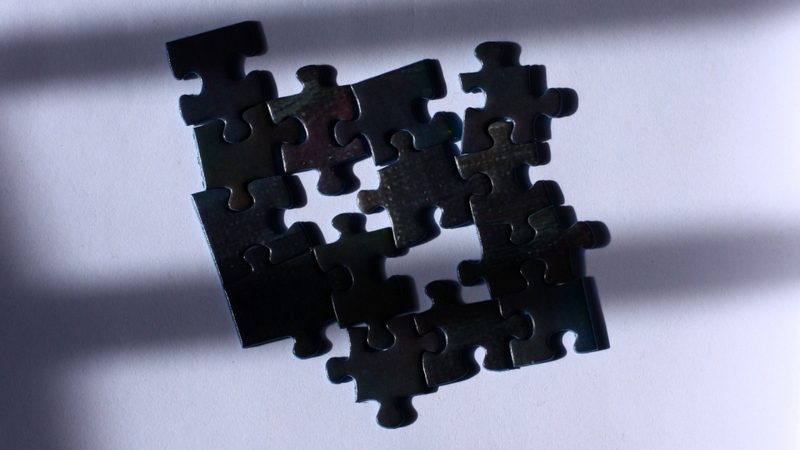 In the Mini Jigsaw photographic series, a selection of pieces from a completed puzzle are assembled to capture something of the essence of that particular puzzle. The selection may be about the image itself or an idea that developed while working on it. As the series develops, I’m finding that the technical choices – how to photograph the pieces – is becoming as important as the choice of pieces. For example, here I’ve kept the natural light from the window and the shadows it cast. It adds something to the theme. It’s a Ravensburger – “Home on the Toast Rack”, a painting by Australian artist John Bradley.